Eagles offensive lineman Isaac Seumalo (73) has agreed to a contract extension. The Eagles continued their busy start to the month by agreeing to a three-year contract extension with offensive lineman Isaac Seumalo on Monday, locking up a player who could be part of the Eagles’ starting offensive line for the foreseeable future. Seumalo, 25, had one year remaining on his rookie contract after the team selected him in the third round of the 2016 draft. He’s now under contract through 2022. Seumalo finished last season as the team’s starting left guard, a role he had actually lost to Stefen Wisniewski early in the 2017 season. Nonetheless, the team has been bullish about Seumalo for three seasons. They gave him the starting job in 2017 after trading Allen Barbre, put him back in the lineup last season over Wisniewski even though Wisniewski started in the Super Bowl, and recently identified him as a player they wanted to keep moving forward. He has 15 career starts, including nine last season. He was clearly better in 2018. He was also bigger, adding 20 pounds to a frame that had been listed at 6-foot-4 and 303 pounds. 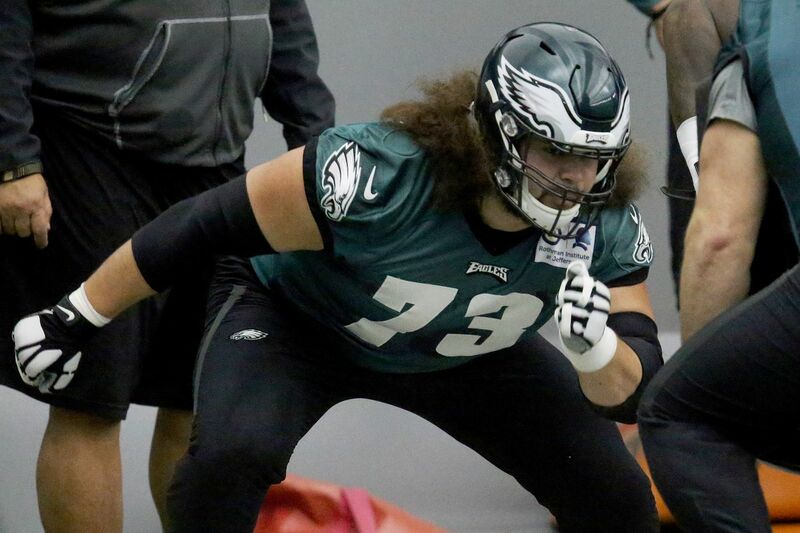 The Eagles are banking on Seumalo’s progression with more experience and stability at left guard. Seumalo’s versatility is an asset — he can play tackle, guard, and center — and he was once viewed as Jason Kelce’s potential replacement at center for the Eagles. Kelce, of course, signed a contract extension Saturday. Seumalo could play next to Kelce for as long as Kelce remains with the Eagles. But if he was ever demoted again, the versatility would make him a valuable game day reserve. The Eagles have a decision to make about Wisniewski, who will count $3.7 million against the salary cap next season. He can be a key reserve at three interior line spots, and that might even require spot starting for right guard Brandon Brooks if Brooks misses time while returning from a torn Achilles tendon. But there’s no clear starting job for Wisniewski if the team is committed to Seumalo, and that’s an expensive cap number for a reserve. The contract extension is also a positive sign for the Eagles’ draft-and-develop strategy. They did not sign any player from the 2014 and 2015 draft classes to a new deal after locking up Lane Johnson and Zach Ertz from the 2013 class. And there are others from the 2016 class who could soon follow. Wentz is the most obvious candidate, although his fifth-year option means he’s two years away from free agency. Offensive tackle Halapoulivaati Vaitai and cornerback Jalen Mills are also candidates from that class. The Eagles have signed Seumalo, Kelce, and defensive end Brandon Graham to contract extensions in the last four days. The league year will begin March 13, when the Eagles can begin making trades and signing free agents. The Eagles are not interested in acquiring Pittsburgh Steelers wide receiver Antonio Brown, according to a league source. A CBS Sports report indicated that the Eagles are a team to watch for the star wide receiver, who is on the trade block. But don’t look for the Eagles to get involved, although the Eagles could look elsewhere at wide receiver.